The number of elderly people in the UK diagnosed each year with cancer is set to rise by 80% in less than 20 years, a report predicts. Cancer Research UK estimates that by 2035 about 234,000 over-75s will get cancer each year – up from 130,000 now. The charity also said the elderly were more likely to have multiple health conditions, leading to later diagnoses. It called on the health service to prepare now for the rise in older patients with “complex needs”. The government said cancer was a “priority” and the prime minister had just announced increased funding for the NHS. Each year, some 360,000 new cases of cancer are diagnosed in the UK. About 36% of diagnoses are in people aged 75 or over but Cancer Research UK’s new report estimates that this will increase to 46% by 2035, largely as a result of the UK’s ageing population. The risk of developing cancer increases as we get older because the cells in our body often become damaged as we age. While cancer survival rates had doubled over the past 40 years, they were lowest among the elderly, the charity said. 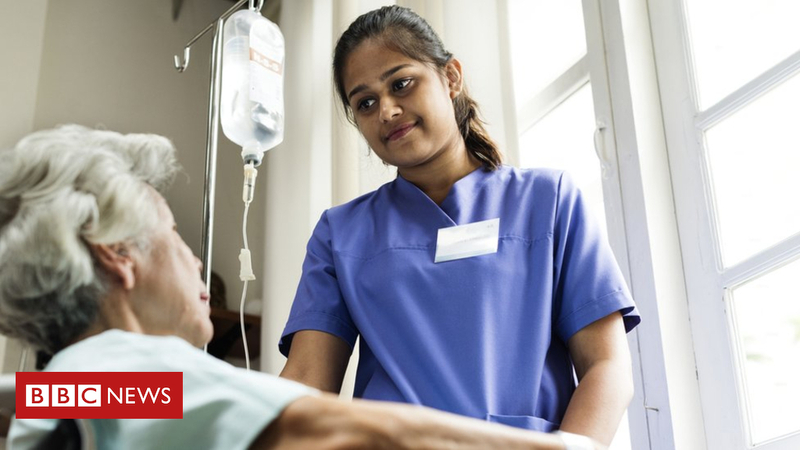 It said older people were less likely to receive curative treatment for their cancer, such as chemotherapy or surgery, something it said highlighted the need for them to receive better support. Older people with cancer are also more likely to have complex medical and social needs, which can make it harder for them to receive the best treatments. Rose Gray, Cancer Research UK’s policy manager, said: “If we do nothing, the disparity in care between older and younger cancer patients will only grow. “It’s vital to address this if we want to realise our ambition of ensuring world-class treatment for everyone in the UK who is affected by cancer. He pointed to Theresa May’s announcement earlier this week of increased funding for the NHS by £20.5bn per year over the next five years, and a 10-year long-term plan for the NHS which will prioritise transforming cancer care. Earlier this week, the government announced a spending boost for NHS England, increasing its budget by £20bn by 2023. Prime Minister Theresa May said this would be paid for with tax rises, as well as economic growth and a “Brexit dividend”. Ms Gray said this investment was welcome but “falls short of what is likely to be needed to truly transform the way that patients are cared for”. Cancer Research UK called on the health service to prepare now for more older cancer patients. This should include making sure staff had enough time to care for patients and providing them with better evidence of how medication affected older patients, the charity said.